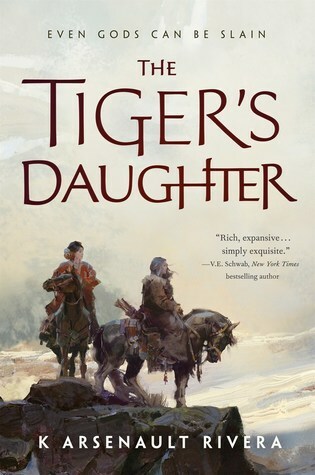 This week on WoW is The Tiger's Daughter by K. Arsenault Rivera. I found this book a few weeks ago on NetGalley and I really liked its summary. As soon as I read the word "demons", I just know I have to read the book in question. Also, the cover is so entrancingly mysterious.The book will be released on October 3rd. "Even gods can be slain…. This is the story of an infamous Qorin warrior, Barsalayaa Shefali, a spoiled divine warrior empress, O-Shizuka, and a power that can reach through time and space to save a land from a truly insidious evil." A Mongolian inspired fantasy would be a change of pace for me. The spoiled empress can add some interesting bits and guarantee some growth (we can only hope!) over the course of the story. I'm intrigued. Ooh! This sounds like an interesting read! Great pick! Not something I normally read but it sounds good and I hope you love it! I heard about this one for the first time last week, and I am really looking forward to reading The Tiger's Daughter as well. Thank you for sharing! Haven't heard of this one before, but it sounds like a good one! Hope you can get it soon to read! Thanks for visiting my Wednesday post on Lisa Loves Literature earlier. What a striking cover! Hope you enjoy it! A unique premise for the story and I love the cover. Great pick - enjoy!